Who knows if this is actually Provençal. People on TV keep saying that puff pastry is so easy to find now, etc. etc. etc. However, that has never been the case for us. We go to supermarkets and all we see is that Tenderflake pastry, not made with butter! But finally, at Superstore, we saw a President's Choice brand puff pastry, and it was indeed made with butter. (I think there was also non-butter stuff in there, but at least it had real butter!) So, we snapped up 2 boxes of those. 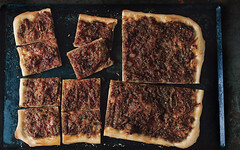 Puff pastry: the possibilities are endless. 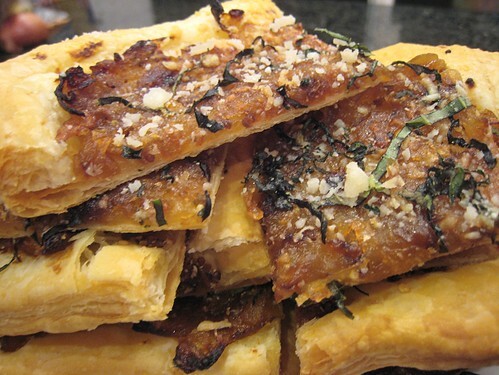 While perusing Gourmet, I saw they had an onion tart in their Provençal menu. I decided to make a Provençal Onion Tart! 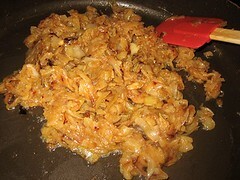 The onions take long to caramelize, so I started that first. 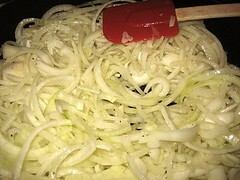 Three big onions were sliced and into a pan they went. Of course, I sneaked in a couple of garlic cloves in there, teehee. They just needed some occasional stirring. After about an hour, they went from this to this. It could've gone darker and more caramelized, but I had been waiting for it for so long already! Upon opening the box of puff pastry, I discovered there were 2 packets in there. I decided to thaw just one. Then, we kind of forgot about it until the onions were almost done. I opened the packet and there was a "tiny" piece of puff pastry. Of course, it would've been better if I actually took a look at it before starting this whole tart, but that may be asking too much. Since it seemed so small, I decided to roll it out (although, it was already fairly thin). Halfheartedly, maybe, as this uneven "rectangle" was the result. I scored an edge and docked the middle. 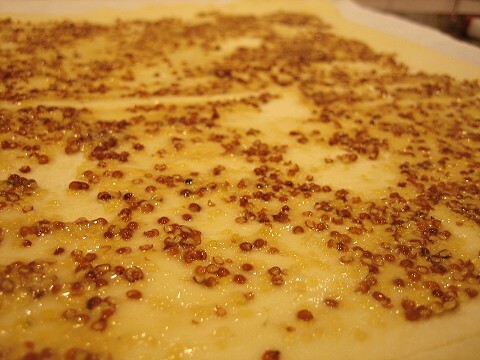 A thin layer of grainy mustard was spread. Back in the fridge it went to wait for the onions to finish. 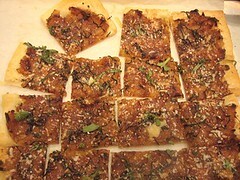 In the meantime, I grated some Parmiggiano-Reggiano and made some basil chiffonade. I actually planned to just tear the basil, but they were grown-up basil, big and tough. Post-oven. It went into a 400F oven. More cheese and basil went on top, et voilà! This one is a keeper. When the tart came out from the oven, I looked at it and said, "Hey, it's just like the picture!" I love the caramelized onion topping. I was concerned that the onions would be too sweet, but I suppose TS worked her magic and pushed it over to the savoury side. 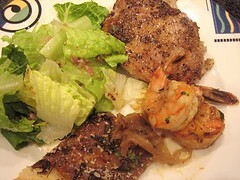 The caramelized onions were great! 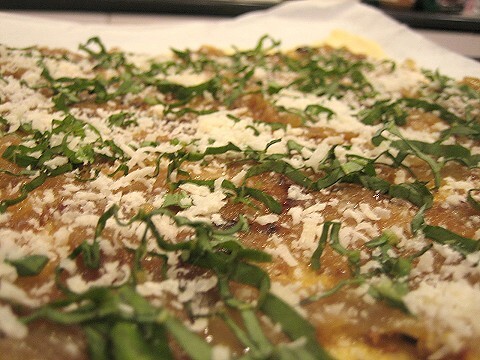 If there is anything, I would enjoy the onion topping more on a more substantial yeast-y, more dough-y, crust. 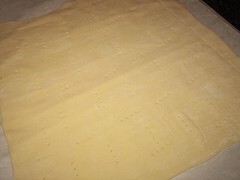 The puff pastry ended up too thin and light for the onions. True. But hey, this was supposed to be all about the puff pastry! Since the pastry was thin, this could've actually had a lot less filling/topping. 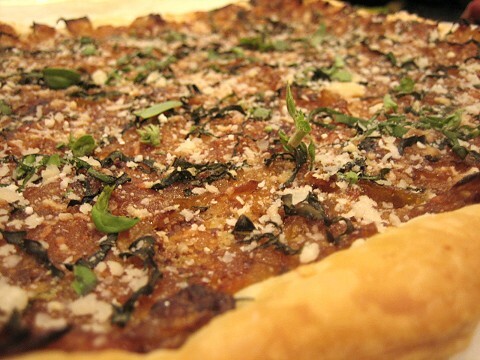 Or, as JS mentioned, it could use a thicker crust. All in all, this Simple French Meal is off to a great start.